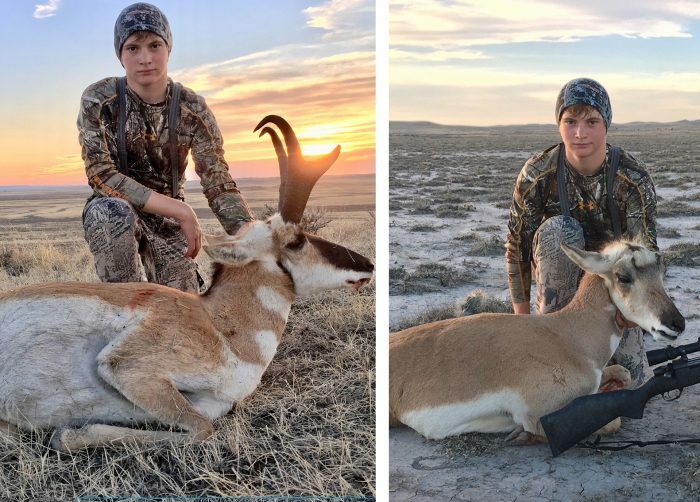 Most of the hunters who came through Region 7 check stations Sunday after the opening of general antelope season found ample opportunities to harvest animals. Upland game bird hunters had a little more difficulty finding quarry, but that was somewhat expected with impacts from the ongoing drought. Most hunters visiting check stations at Custer, Broadus and Mosby were after antelope, but a few were still chasing deer or elk before archery season wrapped up or hoping to bag some birds. Broadus did not see as many hunters as the other two stations, but the ones who stopped were very pleased with what they encountered. Seventy-three hunters came through Broadus on Saturday, up from 48 in 2016. Fifty antelope were harvested – 43 bucks and 7 does – compared to 33 last year. Hunting parties had a good day, with 29 of 32 groups bagging antelope for a 91 percent success rate. The individual success rate for antelope was 66 percent. One adult pheasant rounded out the bounty coming through Broadus. “Most hunters thought antelope numbers are high,” DeVore said. “What does seem to be the case, however, is apparently the best densities are south of Ekalaka (in the southern third or fourth of the region), but as you go north of Ekalaka, numbers are more sparse. One of the parties pursued both antelope and upland game birds, and another party pursued both deer with archery and antelope. DeVore was joined by Upland Game Bird Biologist Justin Hughes and wardens Connor Langel, Tim Fawell and Zach Phillips. Traditionally, Fish, Wildlife & Parks operates a check station at the Hysham area rest stop, but recent construction moved that to the Custer rest stop. The FWP crew there saw 231 hunters, up from 211 last year. Staff checked 124 antelope, compared to 114 in 2016. Sixty-two percent of hunters were successful, compared to 85 percent last year. Earlier antelope surveys had indicated that populations haven’t recovered quite as well in areas north of Hysham and Forsyth as they have elsewhere in Region 7. Pheasant hunters struggled, however, according to Atwood. Custer was manned by Atwood, Wildlife Manager John Ensign, Non-Game Biologist Brandi Skone and Hunting Access Coordinator Travis Muscha. “It was a windy weekend with scattered showers, but the roads were mostly passable,” said Region 7 Wildlife Biologist Jesse Kolar of conditions at Mosby. “We had 67 parties and 106 hunters stop at the check station between 10 a.m. and 5:15 p.m. Hunters were primarily targeting antelope,” Kolar said. Seventy-eight antelope were checked – 49 bucks, 13 does, 15 fawns (one animal’s age was not recorded). Of the 93 hunters targeting antelope, 67% were successful – a slight drop from last year’s 72%. Only five hunters were unsatisfied with their experience, and of those, three hunted in the Cherry Creek area. Low densities of antelope were observed by most hunters who chose that area. The eight upland game bird hunters queried saw very low numbers of birds, but it wasn’t quite as bad as they expected. Kolar was joined at Mosby by fellow Wildlife Biologist Melissa Foster, volunteer Mayra Foster and Warden Captain Jack Austin. General season for deer and elk opens on Saturday, October 21.